It was a fine sunny August 1st 2018 and there were no hail stones, moorland fires or natural disasters in God’s Own County! A couple of organisations in and around Skipton earned a special mention when the grandson was giving two grandparents a rostered day out. Just by the railway station exit opposite Herriots hotel is the ‘fire station’ or HQ for the Skipton Fire & Rescue Service. 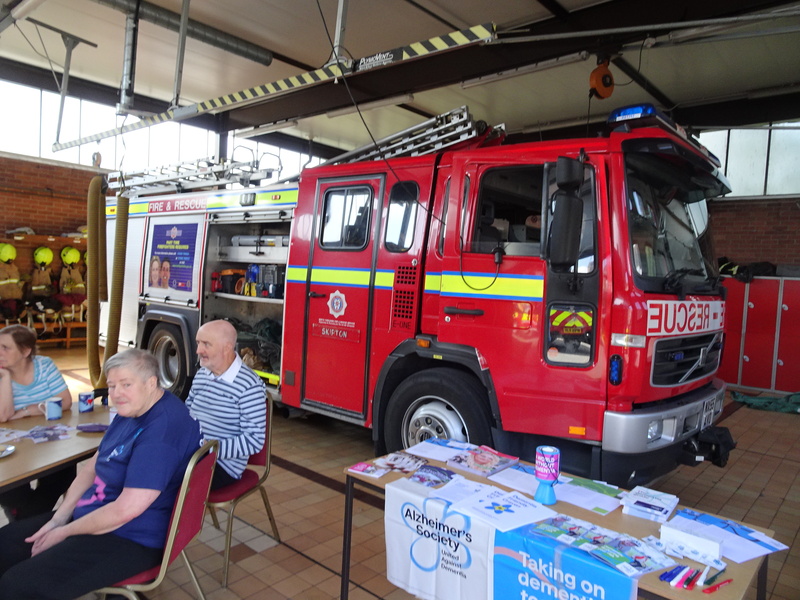 As we arrived they were holding a charity and awareness raising event highlighting dementia. The active team arrange several events including this on Yorkshire Day and are holding an other open day on Sunday 17th August 2018 between 10am-4pm. On Yorkshire day we were treated to tea and treats from Betty’s in Ilkley, collected by the fire chief on his way to work. The local folks home arrived in a mini bus with a hoist for wheelchairs that amused the grandkid. There were no call outs whilst we were there but records show there were two later in the day to keep the retained fighters on their toes. The photo shows an aspect of ‘service’ that is easy to overlook. 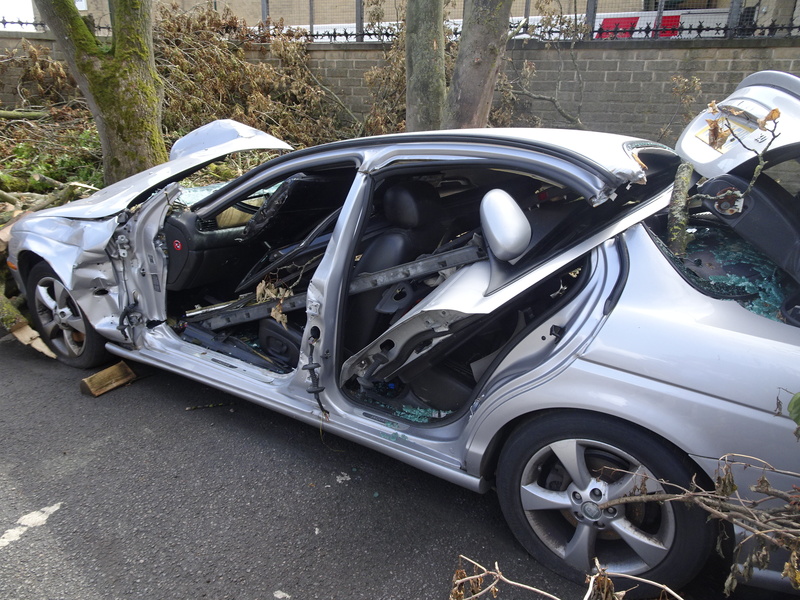 The damage car was one of several that were held in the fire station yard after the rescue of driver and passenger had been completed. Summary An impressive show of community spirit well done to the team. Help them by supporting future events. This outfit have been under the media and travelers cosh for several months. Strikes over driver operated trains, overcrowding, pay disputes and new timetables have contributed to the problems. Not on Yorkshire Day! The local ticket office found the cheapest way to travel to Skipton with a combination of metro card and senior rail passes. It was well worth collecting 8 tickets for the 2½ of us. Whilst I was struggling with the buggy the cheerful conductor hoisted the 2½ year old up on to the train. Shipley was the 4th station and first change. Down the tunnel under the Bradford line to the Skipton platform left us one minute to wait for the on time train. The conductor walking down the isle niftyly side stepped the buggy which we still hadn’t worked out how to open and close. Passing through Keighley we could see the Worth Valley railway had an engine in full steam and at least one of our party regretted not disembarking for a longer look. Skipton station yard car park had a wazzock parked in a way that stopped the local bus making its normal turn. The return journey was assisted by a ticket collector who recommended staying on platfom 1 rather than rushing to platform 4 for the stopping train to Shipley. The both trains then arrived in Shipley at the same time but we had a dash across the car park to get the Ilkley train using the 2 lifts and running across the cobble with the kid in the buggy. Summary Northern Rail did Yorkshire Day proud. The staff were friendly, the services ran on time and the cost for 2 pensioners and the toddler was good value. Department stores are having a hard time and many are jaded and passed their sell by date. People with time and disposable income to spend often have enough ‘stuff’. The need for departmental stores is vastly different to the 1960’s when these shops were enjoying their hey day. In the Skipton store there is no ‘experience’ or sense of fun except watching 4X4’s fight for a space in the free HoF car park to avoid paying in the adjacent council car park. Linea the House of Fraser own brand sounds more like a southern European bus network. Such own brands carry no intrinsic value. The renovated cafe was light and airy with lots of tables crammed in. Shame it was only half full at the height of lunch time. That didn’t improve the service with 2 sandwiches and a kids meal taking over half an hour to arrive! Summary Thank goodness the street market pulls visitors in to the town. If HoF is not rescued I hope good, successful new tenants for the shop are found promptly.